In terms of utility cost and environmental concerns, energy conservation is vitally important for today’s businesses and homeowners. There are many kinds of energy efficient fixtures and low-energy light sources, such as LED bulbs and luminaires. But you want to make sure you’re only using as much electricity as you need, when you require it. If the room is not being used, why keep it lit, wasting money and energy? The final piece to the puzzle of “going green” to reduce emissions that cause air pollution and climate change is to use a lighting control system that squeezes the most efficiency from your lighting fixtures. The purpose of lighting controls is to minimize the electricity usage while maintaining the right amount of light when and where you need it. Beyond the simple on/off switch, there are various kinds of lighting control systems, such as clock switches, daylight sensors, manual and automatic dimming systems, centralized controls, vacancy sensors, and occupancy sensors. Occupancy sensors are one of the first (and among the easiest) types of automated lighting controls that you can use to realize the greatest energy efficiency from your light fixtures. They are commonly seen in commercial buildings, since they are easy to install as part of an existing lighting system. What’s an Occupancy Sensor and How Does It Work? An occupancy sensor, also known as a motion sensor, can detect the presence of occupants in a room. When someone enters a room, the occupancy sensor automatically turns on the light. When the person leaves, the light shuts itself off. The field of view can usually be adjusted, as can the amount of time the system waits after someone leaves before shutting off the light. A more sophisticated system might slowly reduce the light with dimming technology. Light-controlling occupancy sensors use different types of sensing technologies. The most common are passive infrared (PIR) and ultrasonic. Others include tomographic motion detection (TMD), camera sensors (image processors), and microwave sensors. Each one has its own pros and cons. Occupancy Sensor (also known as a Motion Sensor when used outdoors) – An occupancy sensor automatically turns a light on as people come into a room, then automatically turns it off after people leave when no motion is detected. They’re most commonly used in rooms that are only used occasionally, such as restrooms, garages, utility rooms, closets, basements, pantries, laundry rooms, storage areas, offices, conference rooms, copy rooms, lounges, and warehouse facilities. They’re especially useful in rooms where it might be difficult or even dangerous for a person to reach for a light switch, due to their hands being full (such as in a storage facility). Vacancy Sensor – A vacancy sensor is like an occupancy sensor, except that someone must manually turn on the light. The sensor then automatically shuts it off after a predetermined length of time, if no motion is detected. These types of sensors are perfect for any high-traffic location such as a hallway, children’s room or bathroom. 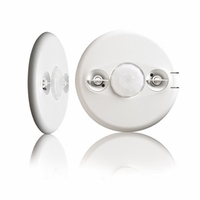 Dimming Sensor – This type of sensor combines the convenience of an occupancy sensor or vacancy sensor with the capability of adjusting the light level with a built-in dimmer. It’s perfect for creating a special ambience in the home, for living rooms, family rooms and dining rooms. Some sensors go a step further and incorporate an optional daylight sensing feature into the overall occupancy sensor design with the use of a built-in photocell. If enough natural daylight is coming into a space, the occupancy sensor will not activate the connected lighting, even if people enter the room. This prevents the lights from being used when they’re not needed. And if it gets dark outside and the amount of daylight into a room drops while people are still in it, the occupancy sensor and photocell will pick up on this and turn on the lights automatically. Using an occupancy sensor with your lighting system, whether for the home, business, or public space, harnesses the power of “smart lighting” for on-demand illumination and a greener, more energy efficient future. Contact us today and let us assemble a custom quote for occupancy and/or vacancy sensor controls for your project.